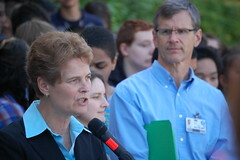 In her boldest policy proposal since taking the reigns of Portland Public Schools, Carole Smith has endorsed a high school system design that would guarantee every student a spot in a truly comprehensive high school, eliminate the ability to transfer from one neighborhood school to another, and preserve all existing high school campuses as either comprehensive neighborhood schools or magnets. This model, described by Smith at a press conference on the steps of Benson High School this morning as “simple, elegant, equitable — and a lot of work,” builds on the success of our existing comprehensive high schools, but will likely preserve small schools as magnet options. Smith acknowledged the difficulty of gaining community support for such sweeping changes. “I know that many Portlanders — justifiably — don’t really trust the school district to make significant changes. They’ve seen faulty implementation and have felt burned by rushed decision-making — whether your experience is with Jefferson High School or the K-8 reconfigurations,” she said. Documents describing the design in fuller detail were posted on the PPS Web site this morning. More details will be presented in September. How could anyone trust these people at this point? They’re going to fix the high schools just like they fixed K-8. I’m almost 60 years old. I went to PPS schools. I have believed in them. I teach in PPS and I have little belief that anything good will come from this latest manipulation of our kids. Maybe it’s time that people who have a stake in the system have some input. Not just the careerists like Vicki Phillips and I’m afraid Carole Smith. Maybe some people with some stake in the community and not just people who see PPS as a notch in their career belt should have some input. Nah. It hasn’t been that way in a long time. I’m glad that I’m ready to retire. I’m tired or rearranging the chairs on the Titanic. This is a shame. This used to be a wonderful district. One of the last good large city systems. And now that we have that settled, can we turn our attention back to the k8 fiasco? ppsvet: In diplomacy it is often necessary to negotiate in good faith, even when trust has been violated in the past. PPS is the only school district most of us have. Some families can afford to move out of district or send their children to private school; most cannot. As for community input, PAT placed a fair number of outspoken teachers on an influential internal PPS design committee, which was instrumental in defining what a comprehensive high school education should look like. I served on a citizens’ committee that had input on the design. I’m not fond of the big public meetings, but Smith’s team held a number of those, too. Other community groups were consulted. Perfect process? No. Better than the public process under the previous regime? Hell yes. I guarantee you that the outcome was not predetermined on this. This was not a process of cramming a preordained design down our throats. This move is big, but it’s not some crazy experimental re-org foisted exclusively on poor and minority schools by a corporate foundation. It’s a very common sense, district-wide approach, similar to a system that’s currently working quite well in the Beaverton School District. So… trust? Not necessarily. Good faith? What other choice do most of us have? Standing on the sidelines throwing stones is not an effective means of negotiation. Terrified: yes, we’ve got to get back to K8s. Hopefully the HS model will serve as an example, particularly with regard to all students being guaranteed a slot in a comprehensive school close to their home. What you are saying sounds logical Steve. But as a teacher who has to go back to a K-8 school with no room for the program “they” promised we’d have, and no input into what that program was supposed to look like, I am MAD!!! When I call to get answers, I get put off or yelled at. And now it feels as if everyone has “moved on” to the next thing, high school reform, when K-8s aren’t even close to being dealt with. Are they even going to? Sheila, I haven’t forgotten K8s, and I’m mad about it, too. I have a kid starting 5th grade next year. We don’t have a middle school in our cluster (Jefferson). For what it’s worth, K8s are next on the agenda for SACET, so it appears that’s next on the priority list for Carole. I personally pushed to have this mess straightened out (or ameliorated) for the school year that just ended, and was disappointed in the lack of response.